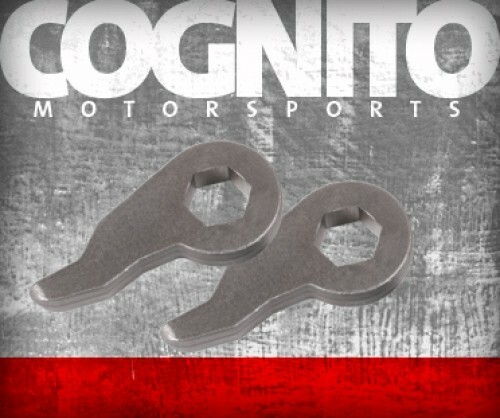 Torsion keys by Cognito Motorsports. These forged re-clocked keys will help get your vehicles front end height to the desired level. Some vehicles may have softer or 'settled' torsion bars and can benefit from these keys. Some vehicles may not need the keys and will not see any benefit over just turning up the adjuster bolt on the factory keys. Many other companies sell this same product and guarantee a factory ride, and that it does not 'over crank' the torsion bars. We guarantee that our product will do everything our competitors torsion bar key kit will do, but we will not make the same claims about the ride quality since other factors also determine the ride quality of the vehicle. Add Cognito Upper Control Arms with shocks or shock extensions for the best in leveling kit ride quality.